Junction City played solid defense and scored in the fourth quarter to upset rival Manhattan, 9-7. Russell Wilkey’s 5-yard touchdown run on the first play of the final period proved to be the winning points for the Blue Jays. The Junction City defense held Manhattan to from there on out, turning away the Indians with a pair of interceptions and a fourth down stand. Defensive back Aaron Hamilton intercepted three passes for the Blue Jays in the game. Junction City’s victory dropped Manhattan to fourth in the current standings on the west side of Class 6A. If the final score seems familiar, remember that Manhattan connected on a Hail Mary on the game’s final play to win 9-7 back in 2009. Incredibly, nine of the last ten meetings between the Indians and Blue Jays have been decided by single digits. Topeka High ran past Washburn Rural on Friday behind a huge night from the Trojan’s talented backfield trio of Ky Thomas, Da’Vonashai Harden, and Jacqez Barksdale. The trio combined for nearly 700 rushing yards as the Trojan’s outscored Washburn Rural 42-13 in the second half to erase a 25-21 halftime deficit. Topeka High did not complete a pass in the game, instead relying exclusively on its talented backfield to gash the Junior Blues on the ground. Thomas led the way for Topeka High with 280 yards on the ground and four touchdowns, while Harden also broke the 200-yard barrier with 220 rushing yards and two scores. Barksdale added 195 yards on the ground with three touchdowns. Dodge City scored all 34 of its points in the second half in rallying to shock Hays High, 34-33 on the Indians’ homecoming. Shawnee Mission East used a goal-line stand and a 99-yard time-consuming drive to hold off No. 4 Olathe North 35-28. Olathe North wasn’t done, however. The Eagles completed a long pass play from Arland Bruce, IV to Devin Stocker to the 12-yard line with time for one final play. That play was a fade pass from Bruce that fell incomplete just out of the reach of Eagle running back Daymonn Sanchez. Bishop Carroll continued its streak in the Holy War with a 28-14 win over rival Kapaun Mt. Carmel. The Golden Eagles have now defeated Kapaun 20 consecutive times dating back to 1999. The Crusaders led this game 14-7 at halftime thanks to a long interception return for a touchdown by Scott Valentas. But Carroll responded late in the third quarter on a Brady Bockover 1-yard run to tie the game at 14. Early in the fourth quarter, quarterback Aiden Niedens connected with Gunner Lynch on a 12-yard touchdown to give the Golden Eagles a 21-14 lead. Carroll would later ice the game with a Niedens to Clay Cundiff touchdown pass with two minutes left in the game. The Maize defense gave up its first points of the season on Friday against Salina South, but the Eagles then used a big second half to pull away for a 42-7 victory. Maize quarterback Caleb Grill threw five touchdown passes to four different receivers in the win. Grill connected with Preven Christon on two scores and tossed one each to KJ Hampton, Camden Jurgensen, and Jordon Helms. Salina South used a long half-back pass to get inside the Eagle 10-yard line and scored shortly after to take a 7-0 lead. The Eagles responded with two Grill touchdown passes to lead 14-7 at halftime before scoring once in the third quarter and three times in the fourth quarter. Maize improves to 6-0 with the win, but has challenging games remaining against Salina Central (5-1) and Class 6A’s top-ranked Derby (6-0). Mill Valley went on the road to Pittsburg and dominated the Purple Dragons, 35-12, to stop as three-game losing streak. The Jaguars intercepted two Pittsburg passes in the first half and turned both into points in building a 28-6 halftime lead. Quarterback Jordan Preston scored on a pair of short rushing touchdowns to give Mill Valley a 14-0 lead. Pittsburg would answer with a Dylan Jordan touchdown run to pull within 14-6, but Mill Valley’s Chase Shryock would later pick off a Purple Dragan pass and return it 55 yards for a touchdown to extend the Jaguar lead to 21-6. Tyler Green’s added a short touchdown run before halftime for Mill Valley’s three-score lead. In a matchup of the top two teams in the newly formed United Kansas Conference, Basehor-Linwood build a 35-7 lead and eventually held off Class 5A No. 5 De Soto, 35-27. The Bobcats led 14-7 at halftime as Marlon McDaniel and quarterback Dylan Mussett rushed for scores. Basehor-Linwood added a pair of touchdowns in the third quarter when Mussett hit Jacob Coleman on a touchdown pass and Brock Hofer returned a De Soto fumble for score shortly after. Dylan Donnelly then hit Matt McKnight on a touchdown pass in the fourth quarter for a 35-7 Bobcat lead. De Soto would score twice in the fourth quarter as Jackson Miller rushed for a score and hit Keegan Sturdy on a touchdown pass. Miller then hit Connor Flynn on a 10-yard touchdown pass as time expired to pull the final margin to eight points. Bishop Miege held off Blue Valley 29-15 in a sloppy game that saw the two teams combine for ten turnovers. Miege grabbed a 14-7 lead in the second quarter on a Jaylen Scruggs 61-yard touchdown run on a toss play. The Stags defense then got into the scoring as Rishi Rattan intercepted a Walker Kinney pass and returned it for a touchdown and a 21-7 lead. Blue Valley closed to within 21-13 before halftime as Kinney hit Nash Sloan on a short touchdown pass. The Tigers narrowly missed a couple of opportunities to tie the game in the third quarter. First Miege’s defense stuffed the Tigers on four tries from the 1-yard line to preserve the 21-13 lead. Miege took over deep in its own territory and was eventually forced to punt. The punt snap sailed over the punter’s head and into the end zone. A Blue Valley player scrambled to recover, but couldn’t not secure the ball before sliding through the end line. The result was a safety, and Miege retained a 21-15 lead. The Stags then added a touchdown on a TyQuez Agnew-Whitten run midway through fourth-quarter to take a two-score lead. Miege intercepted Kinney six times in the game and recovered another fumble. Meanwhile on offense, Sam Pedrotti passed for 146 yards and a score, but was also intercepted two times. Miege played without running back Brison Cobbins and instead was led on the ground by DeAunte Parker’s 69 yards on 20 carries. Smoky Valley used its formula of a consistent running attack and strong defense to beat Chapman, 30-22, in the Fan’s Choice for the Kpreps Game of the Week. Smoky Valley built a 16-6 halftime lead behind a touchdown pass from Lane Schrag to Tim Lambert, Jr. and a Cort Elliott touchdown run. Chapman surprised the Vikings with an onside kick to begin the third quarter, and converted the recovery into points when Izek Jackson hit Brandon Colston for a second touchdown pass to cut the lead to 16-14. Lambert answered for Smoky Valley with a 15-yard run to extend the lead to 24-14, and Schrag applied the dagger with a 67-yard fourth-quarter sprint down the left sideline for a 30-14 lead. Chapman added a late touchdown on a third Jackson to Colston connection, but could not recover the onside kick. Lambert led Smoky Valley with 155 rushing yards and a touchdown on the ground, while Schrag added 130 yards. The victory keeps the Vikings atop the District 5 standings with games against Halstead and Rock Creek remaining. 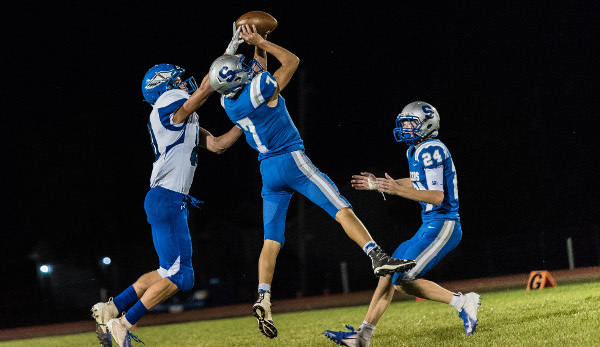 Cimarron quarterback Dylan Harrison lofted a 46-yard touchdown pass to Dylan Newton with :40 seconds remaining to lift the Bluejays to an 18-14 victory over previously-unbeaten Lakin. Lakin took a 14-12 lead into halftime with the difference being a successful two-point conversion attempt from Juan Banuelos to Jaylyn Hash. The two defensive units held serve in the second half with Cimarron denying the Broncs points on a goal-to-go situation. Late in the fourth quarter, Cimarron again stopped Lakin on downs and subsequently drove 81 yards in a minute and 11 seconds for what turned out to be the winning score. While Lakin’s defense held Cimarron leading rusher Tate Seabolt in check with just 36 rushing yards, Anthony Erives had another big game in rushing for 123 yards and a touchdown. Cimarron likely wrapped up the District 7 title with the victory as the Bluejays should be heavily favored in their two remaining games. Jackson Heights grabbed the upper-hand in District 3 by escaping Troy, 8-7 on Friday night. Each team’s lone touchdown came in the first half as Jackson Heights answered Troy’s early touchdown with a Conlan Bruggeman 1-yard scoring run. The difference in the game provided to be Cooper Williams’ ability to sprint to the end zone on the ensuing two-point conversion to give the Cobras an 8-7 win. Troy threatened late on a long pass play from Kipp to Reid Jasper, but the Jackson Heights defense stiffened and held the Trojans out of the end zone. Hillsboro improved to 5-1 on the season with an 18-14 victory over rival Marion. The Warriors held a slim 14-12 lead late in the game and had the ball inside the Hillsboro 15-yard line threatening to add to their lead. But on a fourth-down play, Hillsboro’s Wes Shaw snagged a deflected pass from Marion quarterback Chase Stringer out of the air and the 6-foot-2, 260-pound Shaw raced 87 yards for what would become the game-winning points. After a 64-30 win over defending champion and top-ranked Hoxie a week ago, St. Francis showed little sign of letting up in a dominating 44-6 victory over Leoti-Wichita County. The Indians raced out to a 28-0 lead at halftime behind a pair of touchdown runs from Jordan Raby and a long touchdown by Brady Dinkel. Shadyron Blanka also got in on the scoring with an interception return for a touchdown in the first half. But the St. Francis defense was the story in holding a Wichita County team averaging 50 points per game to only six points on Friday. South Central took control of District 2 with a 36-14 victory over previously-unbeaten Caldwell. The T-Wolves scored 30 unanswered points after Caldwell took a 14-6 lead late in the second quarter. South Central tied the game at halftime by scoring on the final play of the second quarter, then took the lead for good on a punt return for a touchdown in the third quarter. South Central has games remaining against winless Oxford and Argonia-Attica (3-2), while Caldwell still has Udall (4-1) and Medicine Lodge (3-2). Spearville picked up a key win in District 6 by defeating Ness City, 16-14. Kolby Stein led the Royal Lancers with 209 rushing yards and two touchdowns on 38 carries. Spearville led 8-6 at halftime and 16-6 entering the fourth quarter before Ness City tacked on a touchdown and two-point conversion. The win keeps Spearville’s hopes of a district title alive as they take on No. 2 Hodgeman County next week. Top-ranked Hanover extended its win streak to 31 games with a 50-42 win at No. 5 Axtell. The Wildcats entered the game having surrendered only six points all season, but found themselves trailing 34-28 in the third quarter after Axtell quarterback Quinn Buessing’s 10-yard touchdown run. From that point on, Hanover scored 22 consecutive points to take a 50-34 lead. Axtell would close the gap to 50-42 with a late touchdown pass from Buessing to Hunter Koch, but the Eagles could not recover the onside kick. Hanover was led by quarterback Daiken Stallbaumer’s four rushing touchdowns, while Carter Bruna added two scores on the ground. Buessing rushed for two scores and threw two touchdown passes to Koch – the 21st and 22nd time they’ve connected for touchdowns this season. In a battle of ranked teams, No. 3 South Barber & No. 4 Otis-Bison ended in a 36-36 tie after the game was cut short at halftime due to severe weather. Despite the anticlimactic finish, the Chieftains and Cougars packed in about as much excitement into two quarters as anyone could ask for. Otis-Bison’s Anton Foust and South Barber’s Trevor Rooks seemingly traded big-play blow-after-blow in a first half that featured ten lead changes. Neither team lead by more than six points. Frankfort improved to 6-0 on the season with a 60-14 victory over Beloit St. John’s-Tipton. The Wildcats and Blujays met in a non-district game as both schools are a part of seven-team districts and thus had this week free from district opponents. Frankfort led 16-14 at halftime, but exploded for 44 points in the second half, including 30 in the fourth quarter. Garret Dalinghaus rushed for six touchdowns to lead the Wildcats. Frankfort returns to district play with games against Axtell and Hanover in the final two weeks of the regular season. Congratulations to the Quinter Bulldogs for snapping a 33-game losing streak with a 54-20 victory over Gove County rival Wheatland-Grinnell. The Bulldogs’ last win came October 10, 2014 when they topped Logan-Palco, 54-34.